Phil's new Succulent plant - is it an aloe plant? Recently into plant care. Bought this lovely little succulent but it had no I.d. Would love to know what variety it is! Comments for Is this an Aloe? thanks for coming here for help to identify your plant. I've tried enlarging your photo to see more detail, but I still cannot quite make out if the leaves are filled with any gel. If that is the case, I would say that yes, it is an aloe vera plant, with a strong dark and light colouring. None of mine have such a strong colour difference in that kind of pattern. 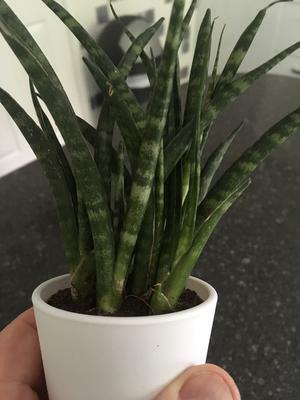 If the leaves do NOT contain a gel then I would be quite sure it is a Sanseveria Zelancia. That is also known by the nicknames, Snake plant or Mother-in-law Tongue. It is quite good to have in your bedroom as it promotes a peaceful sleep. I've had quite a number of those plants, but they sold well in fall last year form a Kijiji ad I had set up. I had just 6 left. Then a little more than a week ago, one of those customers in the fall phoned me and asked if I had any more she wanted some more. I kept back my last two plants for myself, but it was nice to see someone who really enjoyed those plants and wanted more. The general appearance of this plant of yours, and how the leaves all point straight is another symptom of a snake plant. An aloe vera plant generally spreads it's leaves out to the sides in a whorl pattern. However, there are hundreds of aloe plant types - including some that grow like trees, so I could be surprised yet. Blessings & Thanks, Phil. Hopefully, others who have more experience will chime in with their helpful answers. Join in and write your own page! It's easy to do. How? Simply click here to return to Indentify Aloe type plants.